The automotive world has known for some time that the Kia brand was planning to launch a rear wheel drive luxury flagship sedan but today, the Korean automaker posted the first official images of the new Kia KH Concept on their company Facebook page – giving us a look at what will likely sit atop the Kia lineup in the next year or so. The Kia KH Concept, which wears badging that indicates that the car is called the Kia K9, will be offered under a different name when it reaches production and the Korean automaker is calling on the help of their Facebook fans to help pick that name. When Kia posted the first three pictures of the Kia KH/K9 Concept early this morning, the company asked that their fans offer up name ideas and in the past 12 hours, some interesting ideas have been posted on the Kia Facebook page. Some of my favorites include the Kia Zepplin, the Kia Luxor, and the Kia Aria – although I think that something like the Kia Prima would fit nicely with their current family of names. The Kia KH/K9 concept is a large sedan with a massive greenhouse area, very much like the Hyundai Equus although as is the case with other joint projects between Hyundai and Kia, the KH/K9 has a distinct look of its own. In short, while the cars are similar in their stance and overall shape, the front and rear end of the two flagship sedans don’t look similar enough to garnish the criticism of one being a rebadged version of the other. The long wheelbase of the Kia KH Concept screams high end luxury with a headlight design similar to what is seen on other luxury brands but the front fascia preserves the look seen across the Kia brand – especially in the large center grille opening. 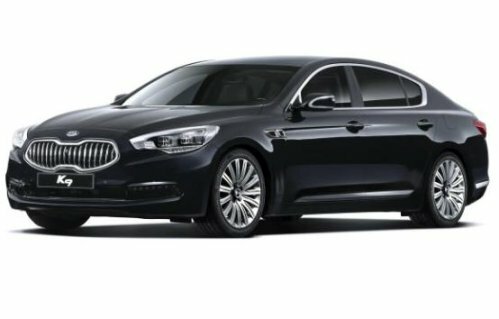 Whatever it might be called when it reaches production form, the large sedan currently referred to as the Kia KH or Kia K9 will come on the same platform as the current Hyundai Genesis sedan and Equus. This means that the KH/K9 will likely share some portion of the engine lineup from the Genesis Sedan and Equus. The Genesis Sedan offers the 333 horsepower 3.8L V6, the 385 horsepower 4.6L V8 and the monstrous 5.0L Tau V8 that churns out 429 horsepower and 376lb-ft of torque. That 429hp Tau V8 is also the standard engine in the flagship Hyundai Equus and overall, the Kia KH/K9 Concept looks more like the Equus than the Genesis but it will be interesting to see if Hyundai will share the powerplant from the Equus. What will be one of the most interesting aspects of the new Kia KH Concept when it reaches production will be the price. Some have questioned the MSRP of the Hyundai Equus, with a price starting at $59,000 for the Signature trimline while the Equus Ultimate starts at $66,000, as they are so much higher than the rest of the models in the relatively affordable brand of vehicles. Kia also has a fairly inexpensive lineup and while the pricey Hyundai Equus has done well for itself – is there really room for two $50k+ Korean luxury sedans based on the same platform? Based on this thought, I suspect that the Kia KH will have a lower price than the Equus and in exchange for the lower price, perhaps the 4.6L V8 will be the premium engine while the Hyundai super sedan will exclusively offer the 429hp 5.0L V8. Anyways, we should know more about the upcoming Kia KH Concept over the next few months as auto show season progresses and if you have a naming idea for the production version of the KH Concept, click here to head over to Kia’s Facebook page to post your idea. Check out the gallery on the right for a look at the Kia KH Concept, along with a shot of the 2012 Hyundai Equus for comparison. Looks like a Buick copy to me.